From left, Hugh Moore, dean, Center for Business, Legal Studies and Entrepreneurship; Hayden Smith; Lauren Dodds, last year's first-place winner; Veronica Aquino; Professor David Moradian; and Dr. Angela Kersenbrock, associate vice president, School of Career and Professional Programs. Seminole’s entrepreneurship contest, Seminole Startup, enters its third year this February, but online, dual-enrolled, and home-schooled learners generally still do not realize they are eligible participants. 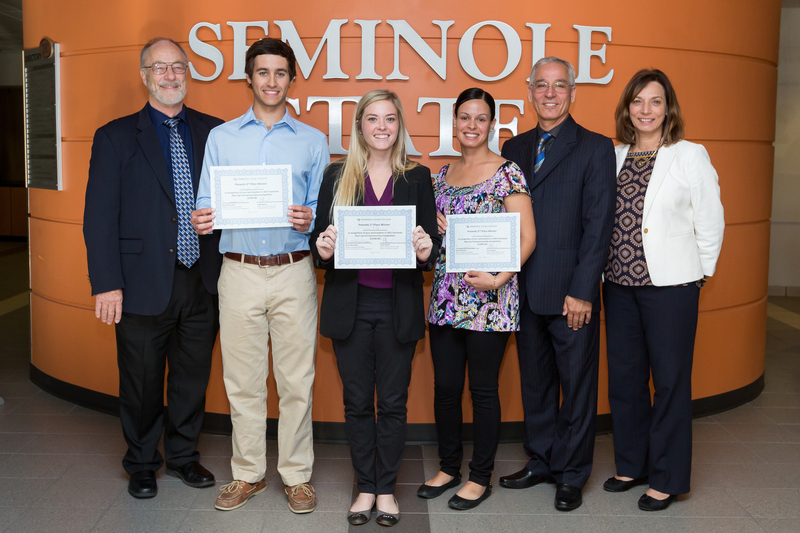 Though many of these students take classes remotely, Seminole’s entrepreneurial program considers these students to just as eligible as on-campus students and encourages them to submit applications to the contest. The competition grants students with business ideas the potential to earn cash prizes and support to bring their dreams to fruition. It does this by providing students with the opportunity to receive coaching from business faculty and by selecting the top three winners to present in front of a business community networking event in Lake Mary. “Every single enrolled student is invited to provide a business plan if they want to start a business … it’s for dual-enrollment students, high school [students]…or any student at least enrolled in one class,” said David Moradian, program manager of Entrepreneurship program. He said non-traditional students receive identical advantages to traditional students, which includes home-schoolers. The Seminole Startup competition awards $2,500 for first place, $1,000 for second place and $500 for third place. To be eligible, students need a Seminole ID and must be enrolled in at least three credit hours at the college. To apply, home-schooled or remote students simply submit their idea in Canvas, the school’s online platform, where it is reviewed by a panel of judges. Three winners will pitch their ideas for business leaders at Lake Mary’s Marriott Hotel from 6 to 9 p.m. on April 12. As is the case with the business competition, home-schooled and dual-enrolled students are also eligible for other similar, networking events. For example, the Emerging Leaders business club, a group that provides networking opportunities and brings students on field trips to companies that offer internships, welcomes online and home-schooled students as well. Former home-schooled students encourage current home-schoolers to take advantage of these entrepreneurial opportunities. “I think that home-schoolers can really benefit from the programs at Seminole State because home-schoolers have the self-discipline, training and the experience of learning on their own,” said Josiah Steimann, a business and information management major. He is specializing in entrepreneurship. He said he encourages home-schoolers to “take full advantage of the program,” including the various clubs and contests. Kelly Woodford, a home-schooled, dual-enrolled senior in high school, said she loves the fact that the college is including home-schoolers in contests like Seminole Startup. She remarked that Seminole is an institution that does a pretty good job of considering home-schoolers’ needs. “Home-schoolers would appreciate this program because a lot of times public schools or colleges cater to traditional students and that requires home-schoolers to work harder for the same results,” she said. Woodford listed a few examples of this. First, she said dual-enrolled students in public high schools do not have to pay the costs for books, and this puts an unfair burden on dual-enrolled home-schoolers who pay the same taxes as everyone else. Second, she said traditional students have guidance counselors, but she added that home-schoolers have to figure things out for themselves. “I am thankful that Seminole is empowering home-schooled students by giving them identical opportunity to the on-campus students in cases like this business contest,” she concluded. The entrepreneurial program welcomes all students. They are also encouraged to apply for Seminole Startup soon. Applications will be accepted between Feb. 12 and March 19 and prizes will be announced in April. For more information, login at http:\\sem.st/startup18.